Provide comfort for the family of Rachele Buccella with a meaningful gesture of sympathy. Rachele passed away peacefully in her sleep on April 6th, 2019 she leaves behind her only son Anthony, his wife Louise and loving grandchildren Christopher, Jonathan & future grand daughter-in-law Galina. 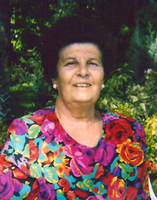 She was born in Alanno, Italy on March 7th, 1930 and immigrated to Canada with her family in 1957. She was blessed with many talents and many friends. We will greatly miss her loving demeanour, warm heart and exceptional baking skills, but we're all comforted to know she's making pizzelle and gnocchi in heaven now. Visitation will be held at the Bernardo Funeral Home (2960 Dufferin St., south of Lawrence Ave.) on Monday, April 8th from 2-4 and 6-9 p.m. Funeral Mass will be celebrated at St. Charles Borromeo Church (811 Lawrence Ave. W., at Dufferin St.) on Tuesday, April 9th at 1 p.m. Entombment will follow at Queen of Heaven Cemetery (7300 Highway 27, north of Steeles Ave.). In lieu of flowers, donations can be made to the Heart & Stroke Foundation or the charity of your choice. To plant a memorial tree in honor of Rachele Buccella (De Melis), please visit our Heartfelt Sympathies Store. We encourage you to share your most beloved memories of Rachele here, so that the family and other loved ones can always see it. You can upload cherished photographs, or share your favorite stories, and can even comment on those shared by others.